Wedding planning can is one of the busiest times in a bride’s life, especially if she’s opted for the DIY wedding approach. There are so many decisions to make, how many tiers on the wedding cake, how many bridesmaid to have, do we invite 3rd cousins twice removed? All this whilst also getting on with the everyday tasks such as our jobs, looking after kids and some sort of social life. This means that, where possible, a bride will want an easy solution to some of the important wedding preparation tasks and decisions. While at the same time still trying to keep that personal, unique touch that says ‘I did all of this myself!’ when we flood social media with our wedding creations. One of the important things on the wedding to do list is the invitations. Most brides like to have their invites match their wedding theme and colour scheme, and I am no exception! However, as a self-proclaimed DIY bride, I also didn’t just want to order invites from a printer service, I wanted to make my own, or at least add on some sort of personal touch. I’m a creative person who dabbles in the occasional homemade gift or craft project so I figured the wedding invites would be a much larger project of mine…however I quickly learned that making invites from scratch wasn’t for me, I couldn’t quite match up my creations to my wedding Pinterest board. I needed some help, at least a base to work from. So I looked into having the invites printed on the outside at least so I could add my own inserts. 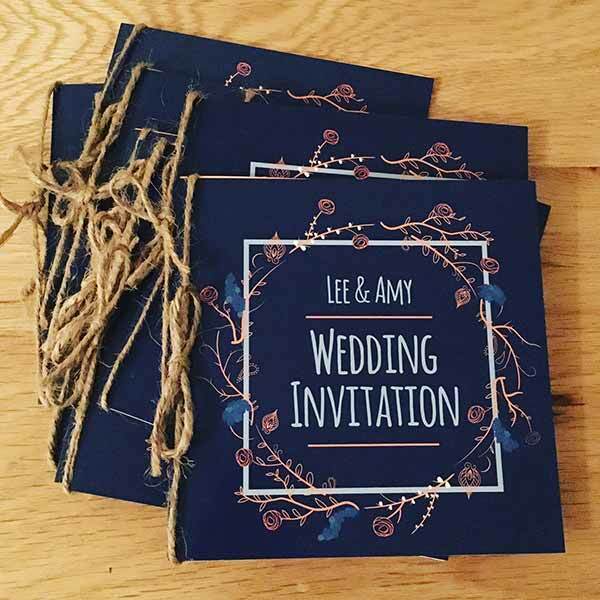 There are plenty of places online that offer pre-designed wedding invites however I didn’t feel like any of them was capturing the style I was after for our wedding. It’s more than just finding a design you like, it’s a way of the bride and groom expressing who they are and what kind of celebration they want for their big day. Some couples want the invites to reflect their personalities and even show off their creative flare! With the success of Pinterest, couples can be more specific about what they want as they are open to a lot of ideas and influences as well as a lot of cheaper DIY alternatives for those of us who are a little tight on budget. This is where Avery WePrint comes in. 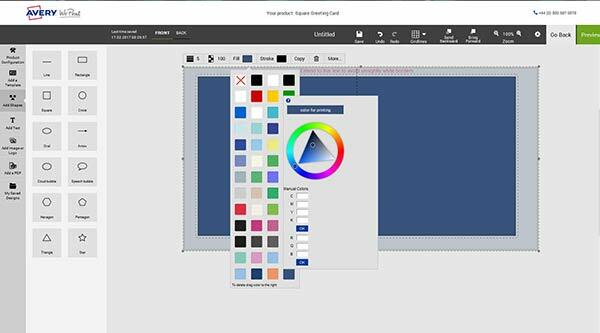 Not only does the website have a few pre-designed templates to choose from but it also lets you create your own from scratch, and they just print and deliver it to you. I had managed to get a simple design together and knew which font type and colours I want to use. All I needed to do was pick the style of card I wanted and then I could start designing. Using the design tool I was able upload my design PDF and then personalise it with the text I wanted. As we needed both ceremony invitations and evening invitations, rather than doing both from scratch I was able to create one design and save it and then use the design again, amend the wording and order the second batch of cards. This meant that both invites would look exactly the same with just a word changed. I decided I wanted to have the invites blank inside as I wanted to stick paper inserts inside. This wasn’t an issue in the designer as it enables you to see the front, back and inside of the cards easily so I could make sure that my design was printed on the outside only. But best of all, I could import my exact colours I’d chosen! The colour selector allows you to input RGB or CYMK colour codes which meant that I could get the invites to match exactly to the colour scheme of the wedding, perfect! I was able to change the background colour and also the text colour. The designer also saved the colours in my colour palette so I could use them again at later date, I’m thinking I’ll be coming back to do the thank you cards! 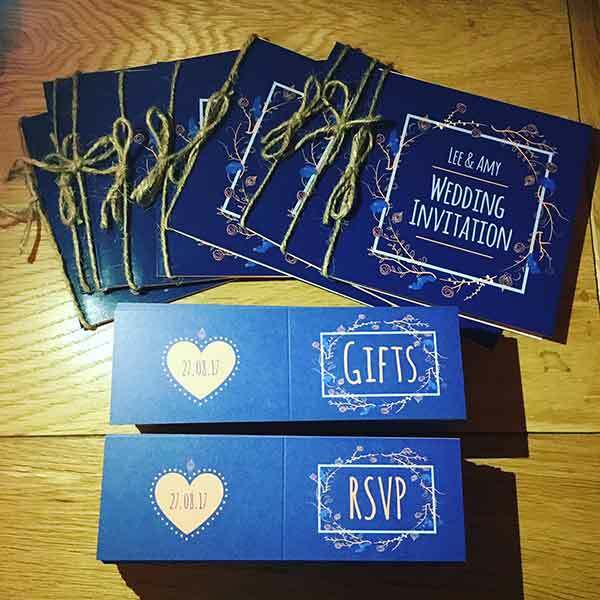 If you’re a bit OCD like me when it comes to matching stuff this was a big plus, now all of my wedding stationary will match perfectly without the added expense of getting it all done by specialist wedding stationer. 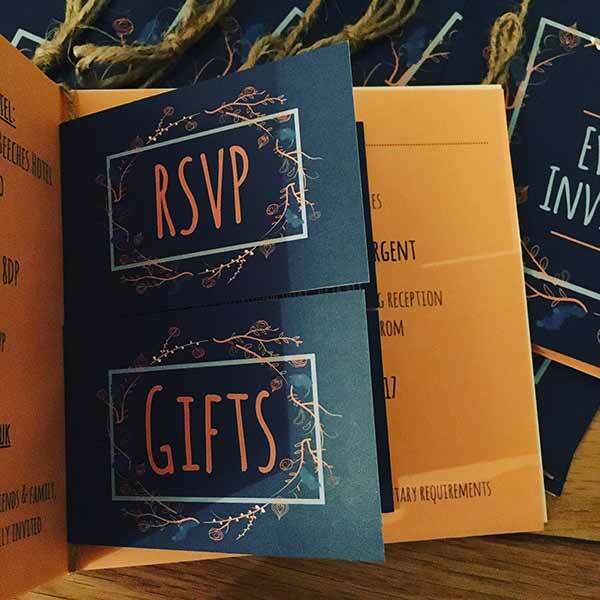 I did worry that designing my own invites would cost more however I was charged the exact same price as a pre-designed card and, as I bought them in bulk, I even got a discount! The prices were clear to see on the website so there were no hidden costs! And with the flat UK shipping fee I was able to work out quickly if they were in my budget and not have to worry about costs for adding colours that some other printers charge for. This really helped with the wedding budget! They were all printed and delivered to me in a matter of days. The card is good quality and the gloss finish on the front makes them look really professional, you wouldn’t think I designed this myself! The print is clear and the colours match exactly what I wanted. Once I started designing the inserts to stick inside the cards I came to the realisation that you need a lot of information to be included. Apparently you have to cater for dietary requirements of your guests and tell them where the hotel is and how they accept or decline your invitation, not that you haven’t got enough on your plate with planning the wedding! I wanted to keep the cards simple, as we are planning a rustic wedding, so I wanted the invites to represent this. I had already decided to add some twine around the spine of the cards (thanks Pinterest!) to add that little rustic touch but I needed something else inside the cards to add the extra information. So I had another look on the WePrint website to see if there was anything I could use for the inside. My original thought was a smaller card insert but then I stumbled upon their unique folded business cards. These cards would fit perfectly inside the invite and I could just hook them on the twine I had already added, problem solved! 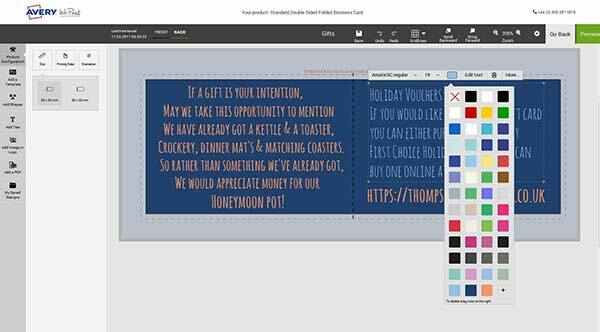 So I jumped back in the designer to create the RSVPs and gift registry cards. As I had already uploaded my design I was able to design the folded business cards to match. I just simply used my design stored under my PDFs and the saved colours in my colour palette and the designs were done in no time! Again the designer allowed me to view both the inside and outside of the cards so I could make sure that all the information was correctly laid out. The folded business cards arrived just as quickly as the invites themselves so I was able to get making my invitations within a week of ordering the cards. As the folded business cards are scored it made the folding very easy, especially when I had 160 invites to make! I’m so pleased with my invites. Being able to design them myself the way I wanted, at no extra cost, makes them really special. Even though the invites were professionally printed I still feel like they look handmade which is really important to me. Rather than getting a high street printer to do them for me, the WePrint designer allows you to personalise them as much or as little as you like. For me it wasn’t just how the cards turned out, it was having control over the process and I actually enjoyed designing the different elements. I’ve been advised by other brides that this part of the wedding planning can have you pulling your hair but this wasn’t the case for me, the WePrint ordering process was simple and stress-free! The folded business cards were also a great success, it might not be what they were originally designed for, but because you can design from scratch you have the flexibility to make the product fit you’re requirements, something every DIY bride needs! I will definitely be sharing this idea on my wedding Pinterest board! 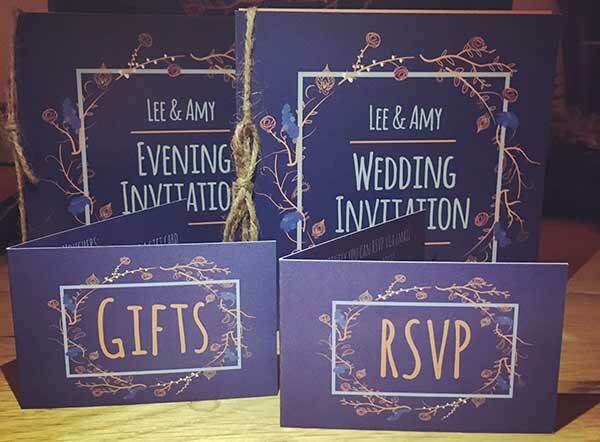 I’ve had a lot of feedback about how the great the invites look and although it may have took me a few long evenings to put all of the elements together, I honestly don’t think I would have got the same results without the flexibility that WePrint offers its customers. It also helped remove some of the stress of wedding invitation designing and buying, something I’m sure other DIY brides can relate to! 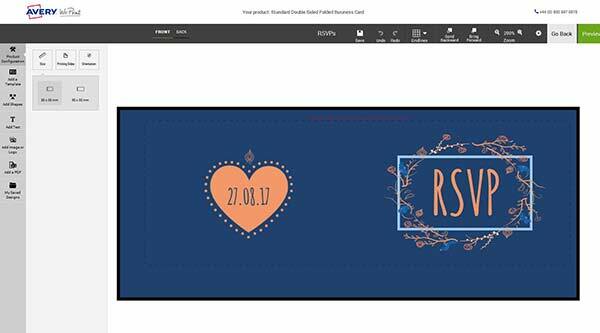 I also have my design PDF and colours stored in my account on the website so if I come up with any other ‘creative solutions’ for my wedding stationary or decorations I know I’ll be able to create them in the design tool and get them professionally printed by WePrint.